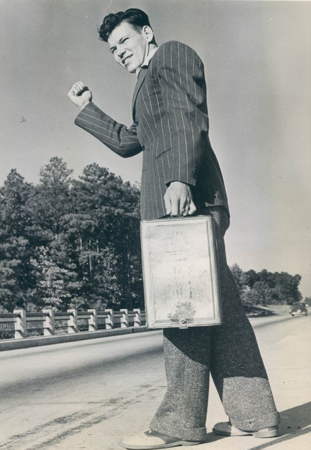 In 1941, Tommy Graham employed a clever, but slightly duplicitous, technique to get rides as he hitchhiked from Maryland to California. He used an oil can as a suitcase, so that drivers thought his car had broken down and stopped to help him out. I wonder if this technique would work today. Do people even pick up hitchhikers anymore? Less effective today, I think. For one, people just don't pick up hitchikers anymore. Insert commentary about sad state of society here. For two, the national highway system has become more populated. Where once you would have to drive 50 miles to get to the next station, now we have gas stations with convenience marts pretty much every seven miles along every major highway, with only a handful of exceptions. You wouldn't be able to hop more than a few miles using this excuse, unless you told them it was a prop. Three, if you actually said that you were using a prop to get people to pick you up, you'd probably get thrown out of the car. You'd have to use a gas container instead of an oil can of course, and given that they're usually plastic, it would be difficult to modify it in such a way that someone actually stopping would not be able to tell. There are way too many places both in the U.S. and in Canada where hitchhiking is illegal. http://www.digihitch.com/usa-region54-cat7.html Carrying a gas can might help but I seriously doubt it since it would probably be a patrolling police vehicle that would pick him up (after other vehicles have used their cellphones to report his trek) and would take him directly to a gas station AFTER asking where he left his vehicle and getting other pertinent info. The last time I was up there hitchhiking is still common in Alaska. I decided I wanted to pick people up when I drove there, and I'm glad I did. I met some interesting people. After generations of propaganda against hitchhiking, I'm not sure if young drivers would recognize what a thumbs up sign meant. The Wonder Twins on Superfriends were pretty harsh in their condemnation of hitchhikers.